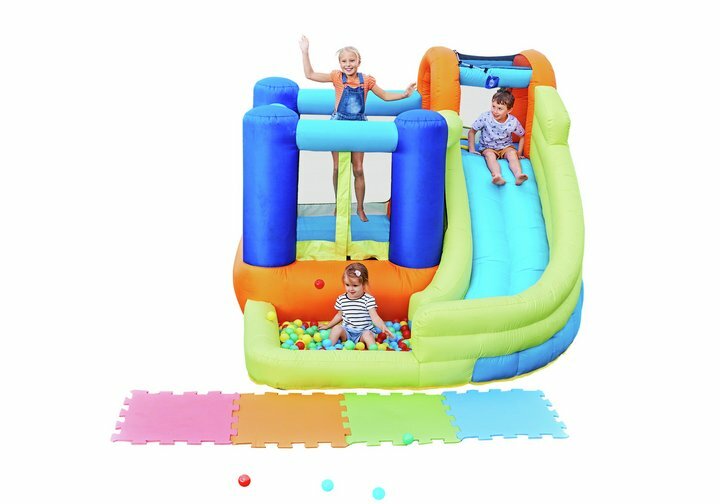 Durable, super quick to get ready (2 minutes with blower) and puncture resistant with extra strong stitching, the Chad Valley Inflatable Funhouse with Slide will provide hours of amazing fun. This charming bounce house is covered with a canopy which leads to a slide angled into a splash pool, providing kids with a fun destination that you can fill with play balls or water. Whether the fun play occurs indoors or out, the climbable wall has chunky child friendly handles, meaning little ones can grip a hold and get out safely. The multi chamber system provides great stability and optimal, constant air-flow distribution. The Chad Valley Inflatable Funhouse comes with stakes, a repair kit and a storage bag. Size inflated H186, W290, D240cm. Get money off with April 2019 free Argos voucher codes, see if there's a discount code for the Chad Valley Inflatable Funhouse with Slide product.